In this excerpt from his new book No Fear of Failure, author Gary Burnison recounts his conversation with Nooyi on what her prior career as a consultant taught her and what she had to figure out on the job. inductive thinking that helped shape her leadership style. and a $13 billion merger with Quaker Oats in late 2000.
but also commit to lifelong learning as a process of continual selfimprovement. the more vibrant the organization will be. learning agility is a key predictor of executive success. 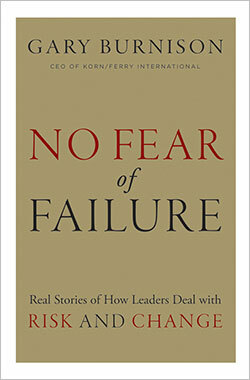 Reprinted by permission of the publisher, John Wiley & Sons, Inc. , from No Fear of Failure: Real Stories of How Leaders Deal With Risk and Change, by Gary Burnison. Copyright (c) 2011 by John Wiley & Sons, Inc. All rights reserved.